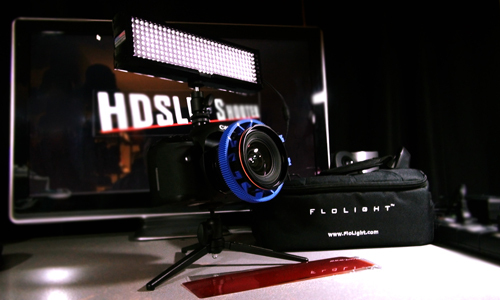 I recently had the opportunity to get my hands on the FloLight MicroBeam 256. This light is a fantastic light for mounting on to your camera’s shoe or where ever you want it. The unit is incredibly light for its size, and it delivers a nice wide wash of white light that will enhance any ENG production or hand held applications. The unit can either be powered with AC power or can also be powered using some of the more popular DV batteries from either Sony, Canon, Panasonic and JVC. The dimming control is extremely sensitive, and it should be quite easy to find just the right amount of light. The MicroBeam256 although lightweight, is incredibly solid, as it’s encased in anodized aluminum. 1/4-20 mounts are milled in both the top and bottom of the unit giving you the flexibility to mount it exactly where you want. The unit I received was set for 5600K with the LEDs set for 60 degrees or “flood” ( the MB256 also comes with a spot or 30 degrees). After I unboxed the unit, I mounted it on my 7D, and the first thing I noticed was how incredibly lightweight it is. To do just a minor test, I set up a diorama of several toys on a shelf 6 feet from where the camera and light were. I set the camera to F5.6 with ISO:160 and an EV: 50 while using the Tokina AF 20-35mm 1:3.5-4.5. I also was shooting with the Technicolor CineStyle picture style. Without the MB256, the camera couldn’t read anything, it was pitch black. Once I turned the FloLight on, I could see everything in clear detail. Although I color graded the footage using Magic Bullet Colorista II with Adobe CS5.5 PremierePro , one can see even without color grading how powerful this light is. When you’re out and about, shooting ENG style or even just run and gun shooting, the MB256 from Flolight will be a huge asset that just might be the difference in getting great footage you use as opposed to shots you can’t see at all. Full filter pack (including a Tungsten filter for daylight models). For more information about MicroBeam256 or any of the other products from FloLight, check out their website at www.flolight.com.